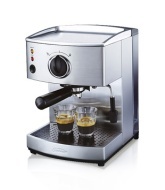 alaTest has collected and analyzed 39 reviews of Sunbeam EM4800C Cafe Crema. The average rating for this product is 3.2/5, compared to an average rating of 4.4/5 for other products in the same category for all reviews. Reviewers are impressed by the reliability and maintenance. The durability and price are also mentioned favorably, whereas many are negative about the design and noise. We analyzed user and expert ratings, product age and more factors. Compared to other products in the same category the Sunbeam EM4800C Cafe Crema is awarded an overall alaScore™ of 78/100 = Good quality. Poor build quality, certainly will not last the distance like earlier models. The machine works well but I have a lot of trouble turning the " easy turn " knob :( ...It was a gift so I don't have receipt ... Maybe the knob is broken. Bit of a shame because I like to buy sunbeam whenever I can. Anyone have any ideas? The water tank. Other budget machines have an internal water tank that is under pressure like a car radiator which makes it hard to refill when hot. This tank is easy to refill or top up. Although it doesn't affect the coffee quality, the drip tray is flawed design. Why did sunbeam use cast instead of stainless steel? Can't fit a mug, or big milk jug, under the head. Very easy to clean, good looks, nice coffee. Bit complicated and froth/crema sometimes hard to achieve. Great machine for the amateur barista. Solid machine, with good instructions to make it perform well. Could have more steam, to speed up the milk frothing and texturing.